Researchers have identified another region of the genome associated with childhood asthma, a condition that affects more than seven million American kids. Analysis of DNA from about 1,700 children with asthma and 3,500 controls, all of European ancestry, identified several genetic variations on chromosome 1 associated with the risk of developing asthma. Many of these same SNPs were then also found to be associated with risk for asthma in a sample of more than 1,600 African American children with asthma and 2,045 controls. All of the newly identified SNPs are located near the gene that encodes DENND1B, a protein known to be involved in the body’s response to foreign particles. “Many of these particles are well-known triggers of asthma. In asthma, patients have an inappropriate immune response in which they develop airway inflammation and overreaction of the airway muscle cells,” explained Hakon Hakonarson, director of the Center for Applied Genomics at The Children’s Hospital of Philadelphia and the senior author of the study, in a press release. The chromosome 1 variations identified by the researchers affected the odds of childhood asthma in different ways depending on ethnicity. Versions of the SNPs associated with increased risk in African Americans were associated with decreased risk in the European sample. This is not unusual in genetic studies, and often reflects differences in population history. The results were published recently in the New England Journal of Medicine. Hakonarson suggests that his team’s finding that DENND1B has a genetic link to asthma could lead eventually to the development of new types of treatments. “Other asthma-related genes remain to be discovered, but finding a way to target this common gene variant [found in the study] could benefit large numbers of children,” he said. 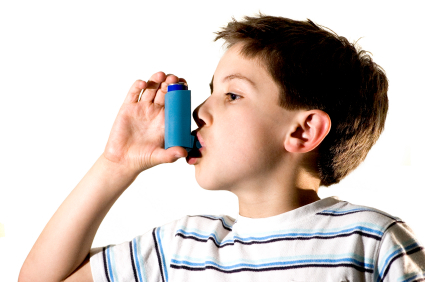 Previous research linked genetic variants on chromosome 17 with the risk for childhood asthma in Europeans. Some of these studies suggested that these variants have an effect only in children who are exposed to tobacco smoke. More research will be needed to work out the details, but the importance of chromosome 17 in asthma was further supported by the current study, which replicated the previous findings in addition to identifying the new variants on chromosome 1.